The Gastein Valley is the "Spring of inspiration"
A big yoga program, anti-stress offers, philosophical and creative events as dance, writing and singing seminars make the "Yoga autumn Gastein - spring of inspiration" to an unique holiday experience. To return with new sensations, new ideas and fresh impetus after the holidays in the everyday life: This is the theme of "Yoga autumn Gastein" in the whole Gastein Valley, with the three tourist resorts Bad Gastein, Bad Hofgastein and Dorfgastein. Numerous creative, sporting, musical, health-oriented and philosophical courses, seminars and workshops are added to the Maintheme Yoga. After the Yoga Events in Spring, the leading health region of the alps is again a trendsetter. Those who practice yoga regularly or begins, would often evolve in many ways. This begins with the conversion of eating habits and goes beyond the desire of being creative, or to meet the everyday habits with more serenity to add philosophical and spiritual themes. For all these desires and goals we want to be a "spring of inspiration". in the truest sense of the word. The yoga sessions are led by highly qualified yoga teachers from Austria and Germany. You can make your individual yoga program from a variety of styles. In the Impuls Hotel we have daily 2 to 3 units yoga in our Yoga Hotel Gastein. 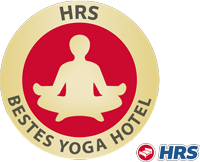 Feel free to use also the yoga offers in the other 17 participating hotels and - depending on weather - in the outdoor areas, in the mountains of the Hohe Tauern, in Bad Hofgastein's big Alpen Therme and around the yoga plattform on the waterfall Bad Gastein. The yoga program is for yoga beginners as well as for advanced and professional users. Whether you get away with a yoga weekend for a few days or if you enjoy the whole week in our beautiful valley - intense and unique experiences wait to. pamper the body, and inspire the spirit: holistic holiday experience in the fascinating mountains of Gastein. The Impuls Hotel is like a "hot spot" of the "Yoga autumn Gastein" - a fine intimate and absolutely high-quality program of lectures and workshops with renowned experts. We are dedicated to topics such as creativity, as well as healthy nutrition, work-life balance and philosophy. Yoga holidays Austria as a source of inspiration. ist seit 2007 Yogalehrerin und hat sich auf Einzelunterricht und Kleingruppen spezialisiert. Ihre Schwerpunkte sind Yoga und Gesundheit, Herzensyoga, Hatha-Yoga und Burnoutprophylaxe, Energiearbeit, Diplom in Ayur-Yogatherapie (nach Remo Rittiner) ), bei der Erkenntnisse aus dem Ayurveda mit Yoga kombiniert werden. Christoph Weiermayer ist akademischer Designer und Künstler, gibt dem Impuls Hotel Gastein mit seinen Bildern in den Hotelzimmern und in allen öffentlichen Bereichen eine unverwechselbare Note. In einer frei zugänglichen Kunstwerkstatt im Loft des Hauses können Gäste ihre kreative Ader entdecken. Das Künstleratelier steht Interessierten täglich 24 Stunden offen. Malutensilien, Papier, Leinwände und Farben stehen zur Verfügung. Klänge, Töne und akustische Schwingungen beeinflussen und berühren uns oft im tiefsten Innersten. Klangtherapien und Klangreisen inspirieren Menschen daher auf körperlicher, emotionaler und intellektueller Ebene. Als zertifizierte Klang- und Schwingungsfeldexperten nutzen Ulrike Schülke und Jochen Enderle diese Empfindsamkeit, um mit Klangbehandlungen und Klangtherapie nach der Methode von David Lindner tiefe Entspannungszustände zu erreichen. Ulrike und Jochen praktizieren seit 2014, unter anderem bieten sie auch Klangmeditationen für Gruppen, Klangkonzerte, Trommeln und Tönen und Märchenklangreisen für Kinder und Erwachsene an.